*Choosing a stretch woven with a matte appearance rather than lustrous silk. 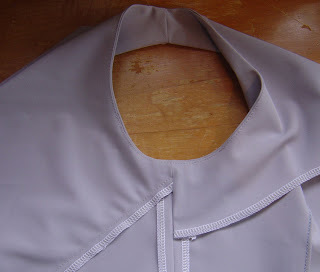 *Adding the separate bodice panels back onto the skirt in the front, as that pointed waist seam did look a bit too bridal to me. Fortunately that was a simple matter of tracing the skirt pattern, then lining up each bodice panel along the seam to trace before adding seam allowances. The back waist seam has quite a bit of shaping in it, so to do the same for the back would have meant considerable manipulation of darts, which I didn't think was going to make any improvement to fit or appearance, so I happily left it. *Adding more flare to the skirt. I'm pretty hippy (ie, have a big bum) and A line skirts tend to suit me better than straight ones. 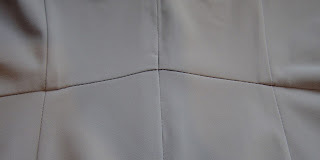 That was a simple matter of extending the side seam line from the hip in a straight line. *And of course, pockets! I like pockets! These ones came from another Burda Style magazine, 03/09, #114 (which is a coat). I like the way the folds echo the cowl. Incidentally, I like the way a cowl in a woven fabric folds like this. My wedding dress had the same thing.